This beautiful sectional sofa with chaise presents casual seating for your home living room space. Highlighted by exposed block legs, the sofa features a tufted bench seat and loose back pillows. Exceptionally casual, this sectional will transform your living room space. The 4558 Sectional Sofa with Chaise by Simmons Upholstery at Dunk & Bright Furniture in the Syracuse, Utica, Binghamton area. Product availability may vary. Contact us for the most current availability on this product. 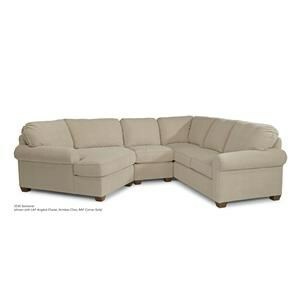 4558BumpChaise Bump Chaise 1 79" 37" 38"
4558LAFSofa LAF Sofa 1 72" 37" 38"